Stuart Geddes is bringing their Mulletover brand of underground house back to the White Isle for the first time since part 2 of their ‘Mulletover in Ibiza’ party back on June 23rd. 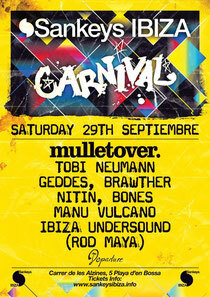 This also double as Carnival’s penultimate party and sees Tobi Neumann return to Sankeys Ibiza alongside Brawther, Nitin, Manu Vulcano, Bones, Ibiza Undersound (Rod Maya) and of course Geddes. Mulletover in Ibiza 2012: Part 1 from mulletover video on Vimeo.